Ao Kuang is one of the playable Gods in SMITE. Then came Sun Wukong to his undersea palace seeking a weapon for his famous journey to the West. Despite the offer of other weapons, Sun Wukong took the Ruyi Jingu Bang, an immense pillar that aided in controlling the tides. It was believed none could even lift it, but Sun Wukong spun it with ease. 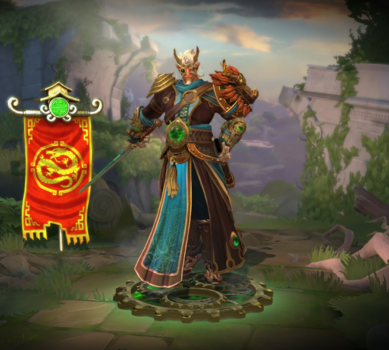 As if this were not humiliating enough, Sun Wukong demanded other gifts of armor, shoes, and helm, all of which Ao Kuang was forced to supply. 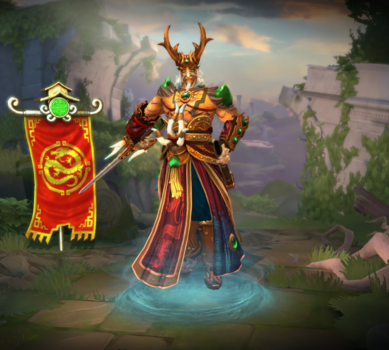 Next, the demigod boy Nezha, playing in a stream, inadvertently shook Ao Kuang's palace. Annoyed, the Dragon-God set forth his favorite scout to kill the child, but Ne Zha defended himself and the scout was slain. Furious, Ao Kuang ordered his third son to destroy Ne Zha, yet Ne Zha slew him as well. Completely outraged, Ao Kuang went to Ne Zha's father and threatened to take the issue before the Jade Emperor, but Ne Zha tackled the Dragon-King and forced him to submit. 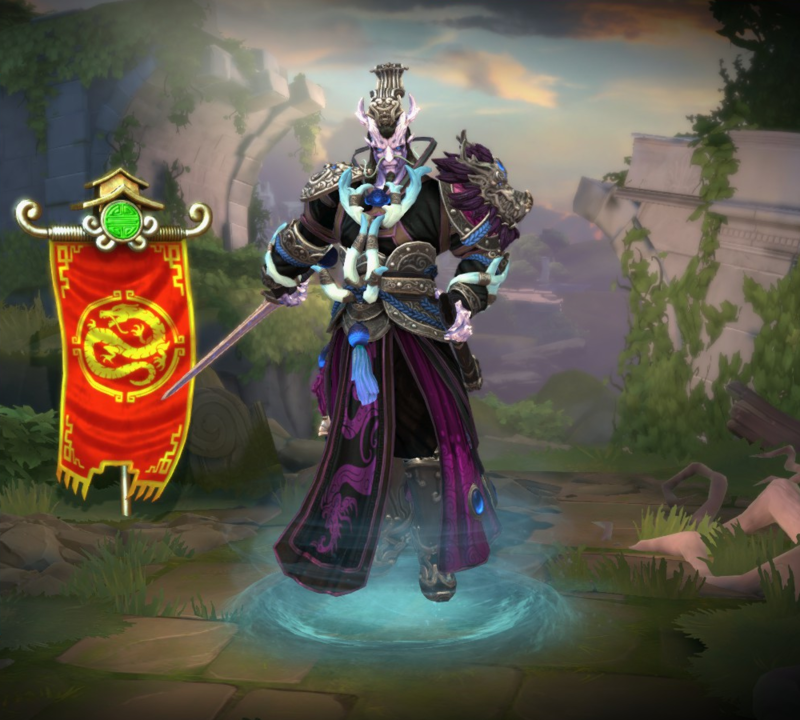 If Ao Kuang enters an enemy structures's attack range while invisible, he'll be revealed. It won't begin its cooldown until after the watery form is detonated. The watery form automatically detonates after 5s regardless of Ao Kuang's status. Can be used during Water Illusion's stealth without dispelling it. The ranged attack will knock back enemy minions or monsters hit. Can deal up to 210/300/390/480/570 (+180% of your magical power) through basic attacks, 120/150/180/210/240 (+78% of your magical power) as a ranged attack. Has a cast range of 17. The execution takes place when the target hits the halfway point of going up into the air. The execute can be avoided by cleansing the knockup effect. 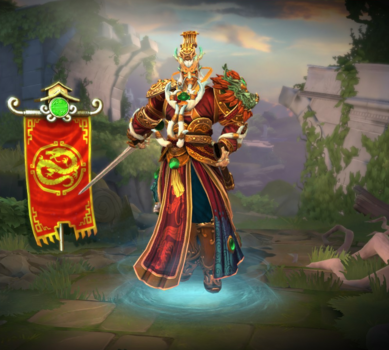 On September 10, 2014 the original Ao Kuang received a major visual revamp that changed the character into Kukulkan, which gave way for the current Ao Kuang. 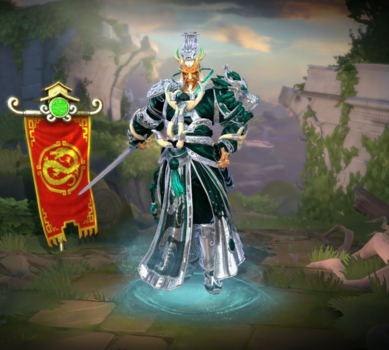 When Ao Kuang uses the ability Wild Storm, the quote "A mighty sword! ", is a reference to the quote the Original Ao Kuang used when he used the ability, Whirlwind, which was "A mighty storm!". Ao Kuang will also sometimes exclaim "Celebration!" when killing a Jungle boss, this is a reference to his original VEW quote which became a meme within the Smite community along with the former quote. One of Ao Kuang's introductions, "Know your enemy, know yourself, and victory will be assured! ..Unless you're fighting a dragon, of course. ", is a reference to a quote from the ancient Chinese text The Art of War. 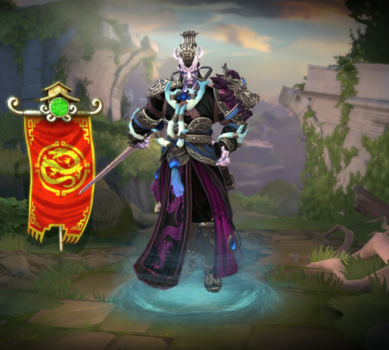 One of Ao Kuang's directed taunts for Hun Batz, "Why do Mayan immortals always look so familiar? ", references the fact that two characters from the Chinese pantheon (the original Ao Kuang and Sun Wukong) were revamped into Mayan deities. One of Ao Kuang's taunts, "You have been weighed, you have been measured, and you have been found wanting! ", is a direct quote from the movie A Knight's Tale. One of Ao Kuang's jokes, "Water can flow, or it can crash! Be water, my friend! ", is a quote from the famous martial artist and film actor Bruce Lee. This skin is based on the Steampunk movement. Both this skin and Ao Kuan were voiced by Kaiji Tang. This skin share it's theme with Madame Blade Serqet. This skin was probably based in the science fiction novel Dune. 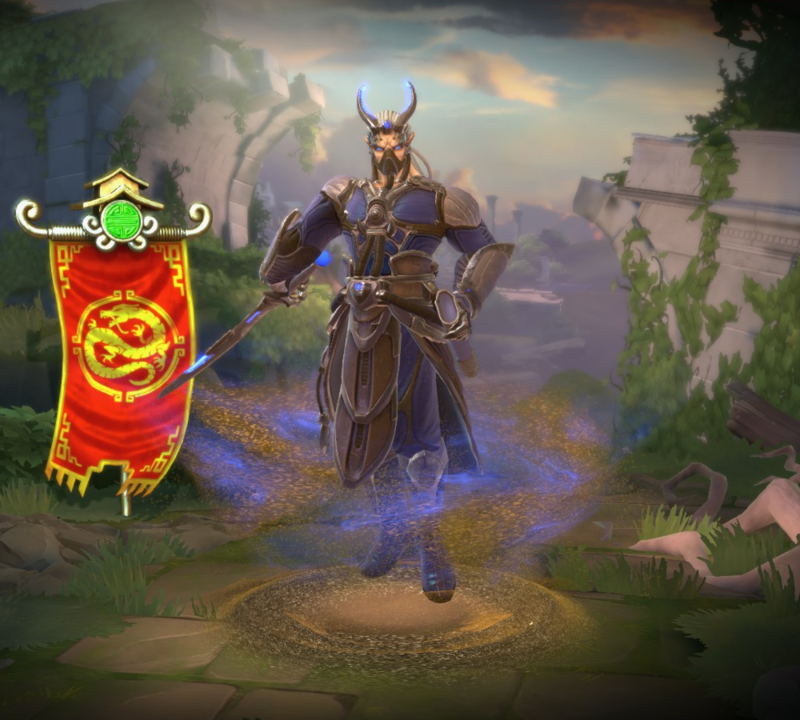 This skin was part of the Odyssey 2018. This skin could have been based on the manga and anime Space Pirate Captain Harlock. 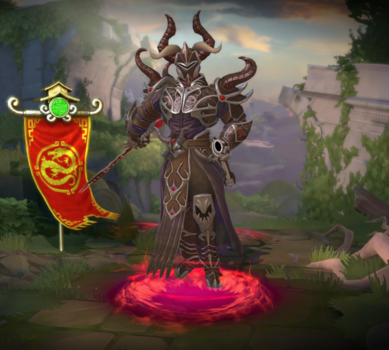 The actor who voiced this skin, David Matranga, also voiced Secret Order Ullr. 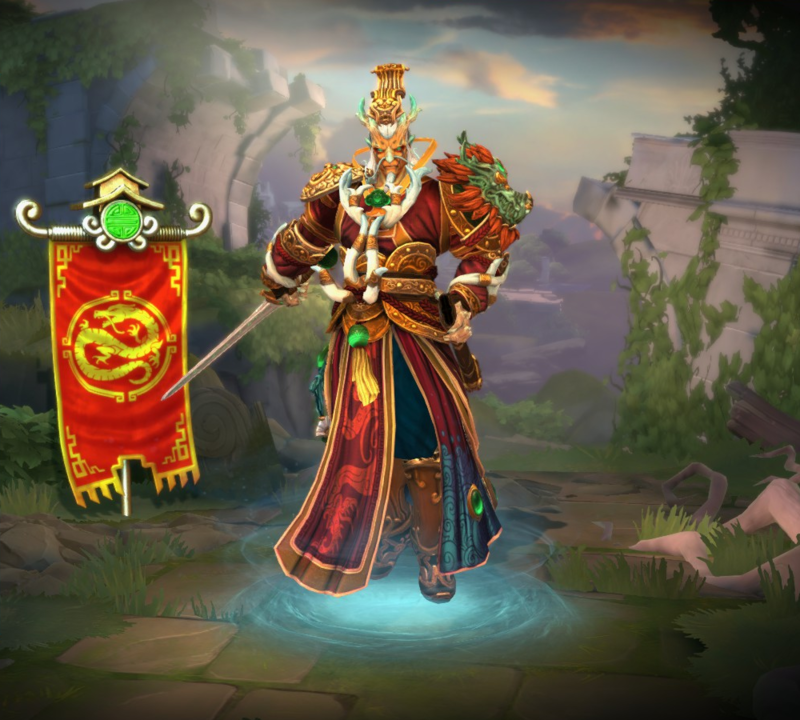 This skin changes Ao Kuang's dragon form to an European Dragon. 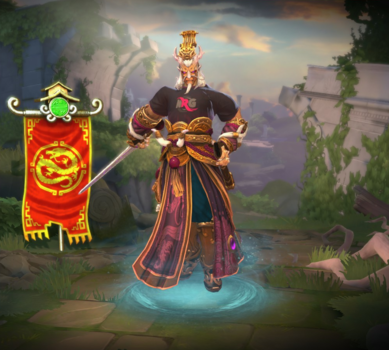 The actor who did the voice for this skin, J. Michael Tatum, also voiced Fernando Ares, Chaacolate Chaac, Father Time Chronos, Lord Slashington III Fenrir, Hercules, Hug Bug Khepri and Sun Wu Xing Sun Wukong. This skin can only be obtained by unlocking 6 or more items from the Odyssey 2016 before January 7, 2016. Every 20 seconds Ao Kuang gets a stack of Dragon King's Sword. With a stack available, his next non-ultimate ability that deals damage to an Enemy god has a reduced cooldown and heals Ao Kuang. Successfully executing an Enemy god with King of the Eastern Seas fully charges Dragon King's Sword. Decreased the Ranged Dragon Throw's Magical Power Scaling from 90% to 78% (from 15% to 13% per dragon). Removed the brief window where Ao Kuang is untargetable during this abilities casting time. Increase Ranged Dragon Damage from 15/20/25/30/35 to 20/25/30/35/40. No longer triggers basic attack items or effects. Will still trigger charges of Dragon Call. Increased Base Damage from 80/125/170/215/260 to 90/135/180/225/270. Increased Mana from 200 → 240. Increase Mana per Level from 36 → 38. Increased MP5 from 4.5 → 4.8. Increased MP5 per Level from .2 → .41. Each time Ao Kuang successfully uses his dragon form to execute an enemy god he gains a stack of Magical Power and Lifesteal. Stacks up to 3 times, stacks are permanent. Damage decreased from 90/140/190/240/290 → 80/125/170/215/260. Damage reduced from 90/140/190/240/290 → 70/120/170/220/270. Magical Power Scaling reduced from 70% → 60%. Fixed an issue where this ability would incorrectly hit non-highlighted targets. Updated description to clarify when energy regenerates. Increased base damage from 30/45/60/75/90 to 35/50/65/80/95 per Dragon. Reduced Magical Power Scaling from 50% to 40%. Increased Cooldown from 5s to 7s. Fixed Polynomicon Passive activating on target when cast at max range. Fixed issue with Restricted Camera. Fixed issue where casting an ability while out of Mana could consume two charges. Fixed several cases where landing the ability would not properly knock up or Execute the target. Fixed 2 energy charges being consumed when out of Mana and using King of the Eastern Seas. Fixed the ground target highlight range being too short. Fixed some popping animation issues when moving and using abilities simultaneously. Added timer on the ground targeter indicating when the ability will expire and Ao Kuang will be forced to land. Fixed passive not consuming energy from using this ability. Updated tooltip to reflect that he replenishes his passive meter after landing from Dragon form. Ao Kuang has been added to the game.